Merry Christmas! Feliz Navidad! Joyeux Noël! Frohe Weihnachten! Joyous Incarnation Day! It's hard to believe but this week is Christmas! That means that you only have one week to invite your friends, family, neighbors, coworkers, and acquaintances to join us for our Christmas Eve service at 5:30 this Sunday. We will open up the overflow area with hopes to even overflow that area! One way or another it will be great celebration of the joy we have because of what God has done for us in sending Jesus to show us most clearly who God is, how to live in fellowship with God, and then making it possible through his sacrificial death for our sins. I hope you will come out for this Joy centered time. Child care will be provided for children from nursery to preschool. Don't delay, register now for the No Regrets Men's conference. You will be blessed by some fantastic national speakers sharing in the main sessions as well as some local pastors leading breakout sessions - including our very own Knute Larson. You don't want to miss this opportunity to keep growing in your faith and developing good friendships with other men. Make sure you sign up before the deadline! 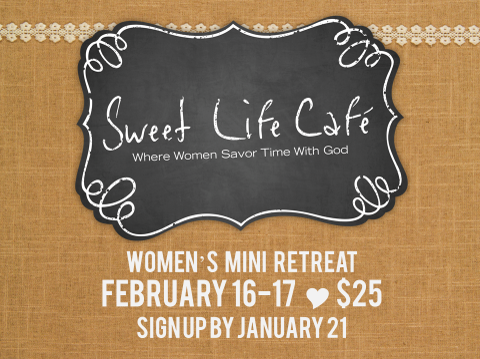 Connect to the sweet life at our women's mini retreat this February. You will love the small group focus, the thoughtful worship, and engaging activities for this two day mini retreat here at Woodland Shores. You can also give an admission ticket as a Christmas gift if you register soon. Sign ups end on January 21 so, make sure you get signed up this Sunday! As the 2017 comes to a close we have the opportunity to end the year strong, but that depends on you. Would you consider a year end gift to help us end 2017 well into the Black? Don't forget that you can give online at www.wsbchurch.com. I look forward to celebrating Christmas with you this year! God bless you this week!